This is yummy bread. It is also very quick to make. You can have it ready in an hour. It is great to serve with spaghetti. Or, just eat it by itself. You will need a 12″ pizza pan, greased. To mix the bread dough, put the flour, salt, sugar, and yeast in a mixing bowl and stir. Add the water and oil and mix to form a soft dough. You may need to add a little bit more flour if it is too sticky. Turn out on floured surface and knead for a couple minutes. Put back into bowl and cover with a towel. 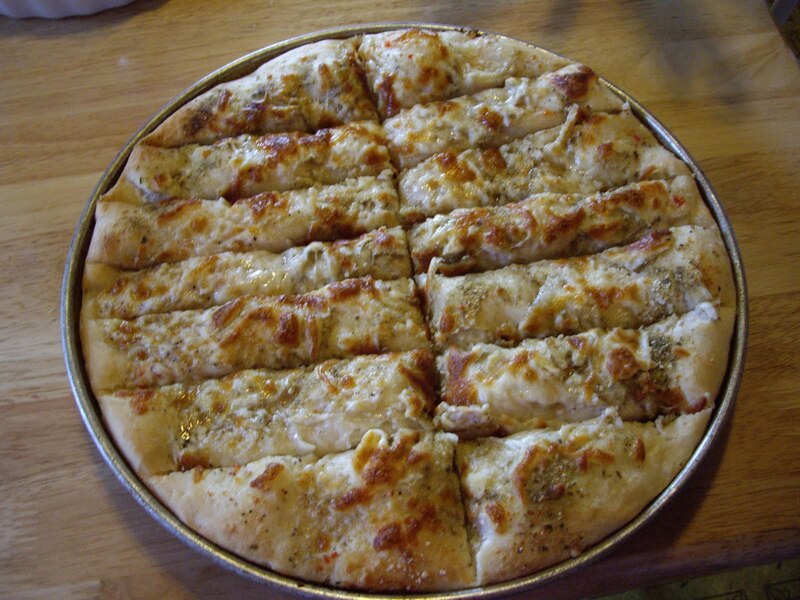 Punch down dough and pat into pizza pan. For the topping mix the salt, oregano, thyme, garlic powder, and pepper and set aside. Brush the dough with the Italian dressing. Or spread with the back of spoon or a knife. Bake for 12-15 minutes until the top starts to turn golden brown. With a knife or pizza cutter, slice it into pieces the size you want.